Home • Blog • Announcing the launch of our new website! We decided a change was needed after we unveiled our beautiful new logo, just over a year ago. But with that fresh new look and layout, we also wanted to deliver a much-improved user experience across multiple devices and make it easier for you to find exactly what you’re searching for in the click of a button. 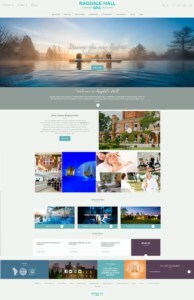 With a new and simplified homepage navigation we’ve made it even easier to make an online reservation, browse our vast range of spa day and spa break packages, and special offers – along with our menu of more than 100 treatments – and access key information for first-time visitors. Of course, with the ever-growing importance of mobile, we paid extra care to ensure the site operates seamlessly on any mobile device, allowing guests full to access to booking availability and all packages on offer and ‘what’s on’ at any time. Our ‘What’s On’ calendar is already proving hugely popular, with many of you looking ahead to check what events are taking place so you can coordinate your visit – check it out if you haven’t done so already! On our homepage you can also sign up to receive regular newsletters from the spa, and access information on the latest events, beauty tips, trends and tricks from the experts, new treatment launches and the latest fitness industry trends in the Ragdale Hall Spa blog. There’s a whole host of smaller but impactful changes, all to make your experience of the Ragdale Hall Spa site that much better for you. As always, we’d love to hear your feedback so please feel free to send your thoughts to us at: marketing@ragdalehall.co.uk.